Also serving communities of Dania Beach, Dania. There are 76 Assisted Living Facilities in the Hollywood area, with 29 in Hollywood and 47 nearby. The average cost of assisted living in Hollywood is $2,786 per month. This is lower than the national median of $3,346. Cheaper nearby regions include Hallandale Beach with an average starting cost of $2,150. To help you with your search, browse the 314 reviews below for assisted living facilities in Hollywood. On average, consumers rate assisted living in Hollywood 3.8 out of 5 stars. Better rated regions include Hallandale Beach with an average rating of 4.0 out of 5 stars. Caring.com has helped 10 families in Hollywood find high-quality senior care. To speak with one of our Family Advisors about assisted living options and costs in Hollywood, call (855) 863-8283. Kozy Kove Assisted Living Facility Inc. Located in South Florida, Hollywood features a beach named Fodor's "Best Beach for Families," a 2.5 miles path along the beach called "Broadwalk" and the Anne Kolb Nature Center. Seniors living here account for almost 17 percent of the population in Hollywood and have several options for assisted living: There are currently 29 assisted living communities in Hollywood, with 33 others located in nearby communities like Hallandale Beach, Fort Lauderdale, and Pembroke Pines. Regulated by the State of Florida Department of Elder Affairs, assisted living facilities (ALFs) in Hollywood are categorized as residential facilities that provide housing, meals, personal care and support services and function as an alternative to 24-hour nursing supervision. In addition to a standard ALF license, Florida also provides three other specialty ALF licenses, including extended congregate care (ECC), limited nursing services (LNS) and limited mental health (LMH). Climate is among Hollywood's bright points, with a summer average high of 90 degrees, an average winter low of 59 degrees and 246 sunny days per year. However, the area is prone to excessive rain in the summer months, with 60 days of rainfall each year and is at risk for frequent hurricanes. The cost of living is high in South Florida and Hollywood in particular, averaging 6 percent higher than the mean in the United States. Florida has no state income tax and is among seven states that do not levy taxes on Social Security or pension income, helping seniors save money on the cost of assisted living facilities. Hollywood does not have significant access to public transportation, with bus routes provided by Broward County Transit and access to limited trolley services. The area is also served by the Tri-Rail, a commuter train system that traverses the tri-county area. Hollywood is a member of the AARP Network of Age-Friendly Communities, meaning that its elected leadership “has made the commitment to actively work toward making their town, city or county a great place for people of all ages,” according to AARP. Assisted Living costs in Hollywood start around $2,786 per month on average, while the nationwide average cost of assisted living is $4,000 per month, according to the latest figures from Genworth’s Cost of Care Survey. It’s important to note that assisted living rates in Hollywood and the surrounding suburbs can vary widely based on factors such as location, the level of care needed, apartment size and the types of amenities offered at each community. For seniors who qualify, there is financial assistance available to supplement the cost of assisted living facilities in Hollywood, Florida. 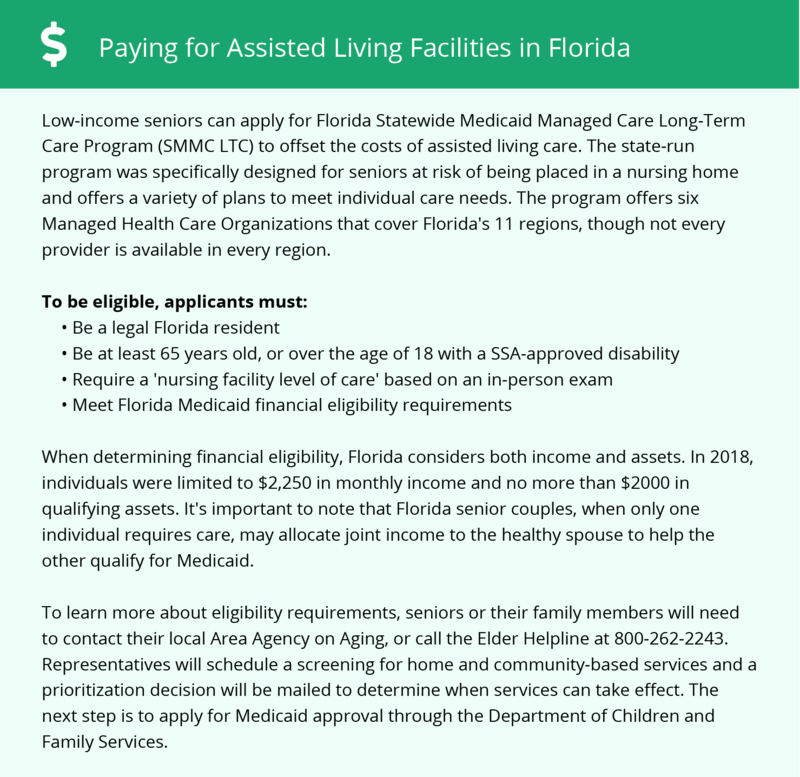 Seniors who are eligible for Medicaid may receive support through the Florida Statewide Medicaid Managed Care Long-Term Care Program (SMMC-LTC). There are also several other programs for non-Medicaid eligible seniors that can reduce costs of care or provide assistance for those seeking support, including Optional State Supplement (OSS), Alzheimer’s Disease Initiative (ADI), and Community Care for the Elderly (CCE). Hollywood and the surrounding area are home to numerous government agencies and non-profit organizations offering help for seniors searching for or currently residing in an assisted living community. These organizations can also provide assistance in a number of other eldercare services such as geriatric care management, elder law advice, estate planning, finding home care and health and wellness programs. To see a list of free assisted living resources in Hollywood, please visit our Assisted Living in Florida page. Hollywood-area assisted living communities must adhere to the comprehensive set of state laws and regulations that all assisted living communities in Florida are required to follow. Visit our Assisted Living in Florida page for more information about these laws.